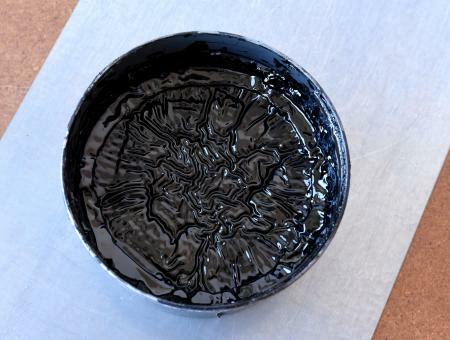 Our VanSon Rubber Base Plus inks are regularly skinning in the can, see IMG attached. Is this normal? That looks almost like oil base ink. Guessing that you have variable climate issues where your ink is stored? How long has this can been open? Rubber base inks are notorious for getting “thick” with age, though this doesn’t look like that. I certainly hope not, at least regarding to the can/label it’s definitely the regular Rubber Base Plus from Vanson (through K & R GmbH Graphischer Fachhandel here in Germany)! Climate is rather unspectacular here. The VanSon rubber base black inks we’ve purchased in the past 5 years or so are doing the same. Reflex blue also. Same here. New-ish cans of black, opaque white, and reflex blue all skinning. Have to assume it’s a formula change. Thinking of switching to Gans for all colors, anybody know if they skin up as well? And aside from the reasons stated in this article, I had heard that they were having financial problems that had interrupted their ability to make and deliver ink. I am sure that the rapidly declining traditional printing market, primarily offset printing, may have contributed to this situation. It is a problem that affects all of our basic needs for printing: paper, ink, rollers, repair parts, supplies in general. The rush to do everything digitally is causing havoc in traditional business methods, products and supplies. ladybones: Gans inks are superb. If you get the higher tack rubber base they are really great for letterpress. Less issues with skinning in my experience than van-son, especially in the original can. I like their color palette as well. They have a thinning agent that is a rubber base tack reducer, it also aids in drying when printing layers of ink overtop one another. Be pretty sparing with it though. In general I have found them to work very well though, and even re-canning the ink into other jars after mixing the color will last quite a long time if sealed properly.